What a difference a day makes! Some of us woke up to a rumble of thunder this morning. After the initial round of showers moved through, winds picked up out of the southwest. Temperatures climbed through the night from the 30s into the 50s. Officially no records were broken, but temperatures were 15 to 20 degrees above average. In Boston the high temperature was 58°, which fell short of the record of 61°. A cold front moved through this afternoon with gusty winds and a significant temperature drop. Winds gusted between 40 and 50 MPH (in most areas) – enough to cause some isolated power outages and pockets of wind damage. Temperatures have been dropping approximately 10 degrees per hour. 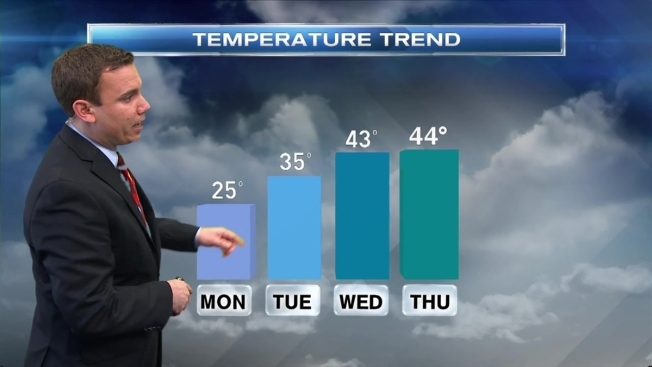 Hopefully you didn’t put your winter jacket back in the closet; Monday will be bitter cold. Temperatures will start off in the single digits and teens, but they’ll only recover into teens and twenties during the afternoon. This cold shot is also short lived. Temperatures will moderate by Tuesday, but the change won't be as drastic as what we experienced this weekend.